municipal bonds: A municipal bond is a bond issued by an American city or other local government, or their agencies. corporate bonds: A corporate bond is a bond issue by a corporation. It is a bond that a corporation issues to raise money effectively in order to expand its business. Treasury bonds: A United States Treasury bond is a government debt issued by the United States Department of the Treasury through the Bureau of the Public Debt, with a maturity of 20 years to 30 years. However, very often the bond is negotiable, i.e. the ownership of the instrument can be transferred in the secondary market. A bond from the Dutch East India Company: A bond is a financial security that represents a promise by a company or government to repay a certain amount, with interest, to the bondholder. The main categories of bonds are corporate bonds, municipal bonds, and U.S. Treasury bonds, notes, and bills, which are collectively referred to simply as “Treasuries. ” Two features of a bond – credit quality and duration – are the principal determinants of a bond’s interest rate. Bond maturities range from a 90-day Treasury bill to a 30-year government bond. Corporate and municipal bonds are typically in the three to 10-year range. Convexity: As interest rates change, the price does not change linearly, but rather is a convex function of interest rates. Convexity is a measure of the curvature of how the price of a bond changes as the interest rate changes. Specifically, duration can be formulated as the first derivative of the price function of the bond with respect to the interest rate in question, and the convexity as the second derivative. Yield to maturity: The yield to maturity (YTM) of a bond or other fixed-interest security, such as gilts, is the internal rate of return (IRR, overall interest rate) earned by an investor who buys the bond today at the market price, assuming that the bond will be held until maturity and that all coupon and principal payments will be made on schedule. The dual use of the word “duration” in the Macaulay duration and the modified duration, as both the weighted average time until repayment and as the percentage change in price, often causes confusion. The Macaulay duration is the name given to the weighted average time until cash flows are received and is measured in years. Macaulay duration: The Macaulay duration is the name given to the weighted average time until cash flows are received and is measured in years. Modified duration: The modified duration is the name given to the price sensitivity and is the percentage change in price for a unit change in yield. The Macaulay duration and the modified duration are both termed “duration” and have the same (or close to the same) numerical value, but it is important to keep in mind the conceptual distinctions between them. The Macaulay duration is a time measure with units in years and really makes sense only for an instrument with fixed cash flows. For a standard bond, the Macaulay duration will be between 0 and the maturity of the bond. It is equal to the maturity if and only if the bond is a zero-coupon bond. A bond indenture is a legal contract issued to lenders that defines commitments and responsibilities of the seller and the buyer. convertibility: Quality of a bond that allows the holder to convert into shares of common stock in the issuing company or cash of equal value, at an agreed-upon price. public debt offerings: A public debt offering is the offering of debt securities of a government, a company or a similar corporation to the public. A bond indenture (also called a trust indenture or deed of trust) is a legal contract issued to lenders. 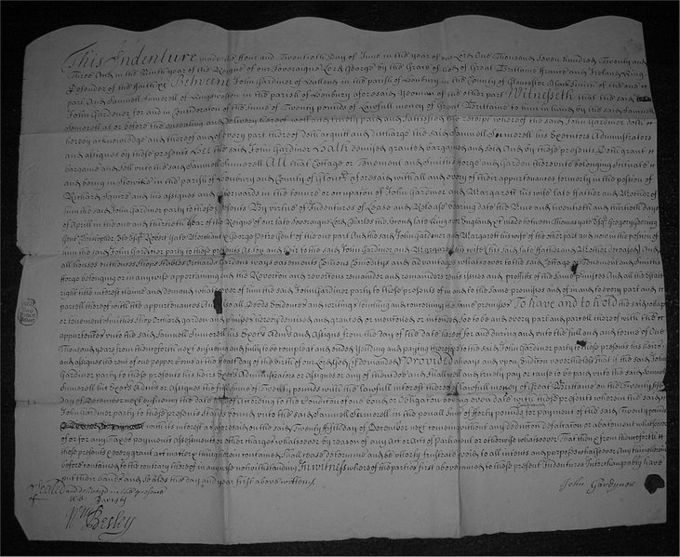 The specifications given within the bond indenture define the responsibilities and commitments of the seller as well as those of the buyer by describing key terms such as the interest rate, maturity date, repayment dates, convertibility, pledge, promises, representations, covenants, and other terms of the bond offering. Failure to meet the payment requirements calls for drastic penalties, including liquidation of the issuer ‘s assets. Indenture: Bond indenture (also trust indenture or deed of trust) is a legal contract issued to lenders. Because it would be impractical for the corporation to enter into a direct agreement with each of the many bondholders, the bond indenture is held by a trustee – usually a commercial bank or other financial institution – appointed by the issuing firm to represent the rights of the bondholders. The issuer of a bond will use the indenture to describe detail about the issuer and the bond trustee for interested investors to research the background of the bond issue. This is to ensure that the bondholder has a clear idea of when to expect interest payments, as well as whom to contact if he or she has questions or concerns. If the company fails to live up to the terms of the bond indenture, the trustee may bring legal action against the company on behalf of the bondholders. When the offering memorandum is prepared in advance of marketing a bond, the indenture will typically be summarized in the “description of notes” section. This offering memorandum, also known as a prospectus, is a document that describes a financial security for potential buyers. A prospectus commonly provides investors with material information about mutual funds, stocks, bonds, and other investments, such as a description of the company’s business, financial statements, biographies of officers and directors, detailed information about their compensation, any litigation that is taking place, a list of material properties, and any other material information. Bond credit rating agencies assess and report the credit worthiness of a corporation’s or government’s debt issues. The ratings are assigned by credit rating agencies such as Moody’s, Standard & Poor’s, and Fitch. 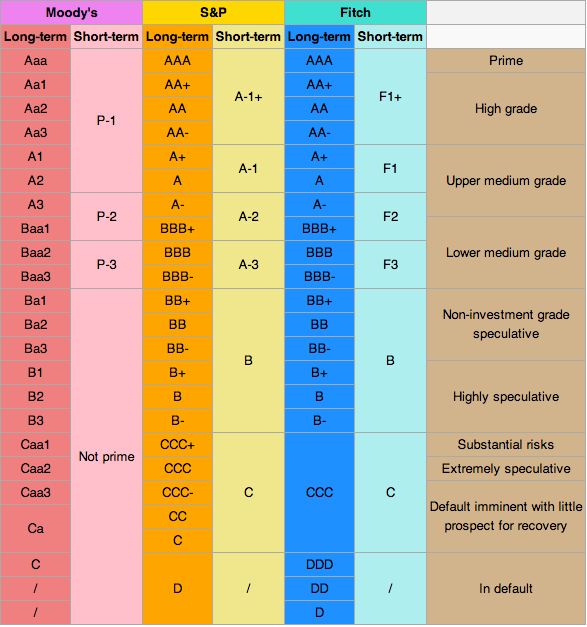 Ratings to have letter designations (such as AAA, B, CC), which represent the quality of a bond. A bond is considered investment -grade (IG) if its credit rating is BBB- or higher by Standard & Poor’s, or Baa3 or higher by Moody’s, or BBB(low) or higher by DBRS. Bond ratings below BBB/Baa are not considered to be investment grade; such bonds are called junk bonds. credit rating agencies: A credit rating agency (CRA) is a company that assigns credit ratings to issuers of certain types of debt obligations, as well as to the debt instruments themselves. In investment, the bond credit rating assesses the credit worthiness of a corporation ‘s or government’s debt issue. The credit rating is analogous to a credit rating for individuals. The “quality” of the issue refers to the probability that the bondholders will receive the amounts promised on the due dates. A bond is considered investment-grade, or IG, if its credit rating is BBB- or higher by Standard & Poor’s, or Baa3 or higher by Moody’s, or BBB(low) or higher by DBRS. Bond ratings below BBB/Baa are not considered to be investment-grade; these bonds are called junk bonds. Junk bonds are also called high- yield bonds. These are bonds that are rated below investment grade by the credit rating agencies. As these bonds are more risky than investment grade bonds, investors expect them to earn a higher yield. The threshold between investment-grade and speculative-grade ratings has important market implications for issuers ‘ borrowing costs. The risks associated with investment-grade bonds (or investment-grade corporate debt) are considered significantly higher than those associated with first-class government bonds. The difference between rates for first-class government bonds and investment-grade bonds is called “investment-grade spread. ” The range of this spread is an indicator of the market’s belief in the stability of the economy. The higher these investment-grade spreads (or risk premiums) are, the weaker the economy is considered. Until the early 1970s, bond credit ratings agencies were paid for their work by investors who wanted impartial information on the credit worthiness of securities issuers and their particular offerings. Starting in the early 1970s, the “Big Three” ratings agencies (S&P, Moody’s, and Fitch) began to receive payment for their work by the securities issuers for whom they issued ratings, which led to current charges that these ratings agencies can no longer always be impartial when issuing ratings for securities issuers. Securities issuers have been accused of “shopping” for the best ratings from S&P, Moody’s, and Fitch, in order to attract investors, until at least one of the agencies delivers favorable ratings.